Not bad (especially in this pic, ha ha!) but it's not really my style. I save tons of all-white interiors on Pinterest and in my inspiration folders. But in my actual home, I guess I need a punch of ....color or something! And those light-cream couches against the crisp white wall were not doing anything for me. HA! HA! Instant lift-up for the weather dependent like me! It took me longer to prepare the room (move the furniture out, line newspapers on the floor, stir the paint) than to actually paint the accent wall. Go ahead and paint an accent wall. Choose the best materials available at your home improvement store and reconsider your whole decor in a new light! 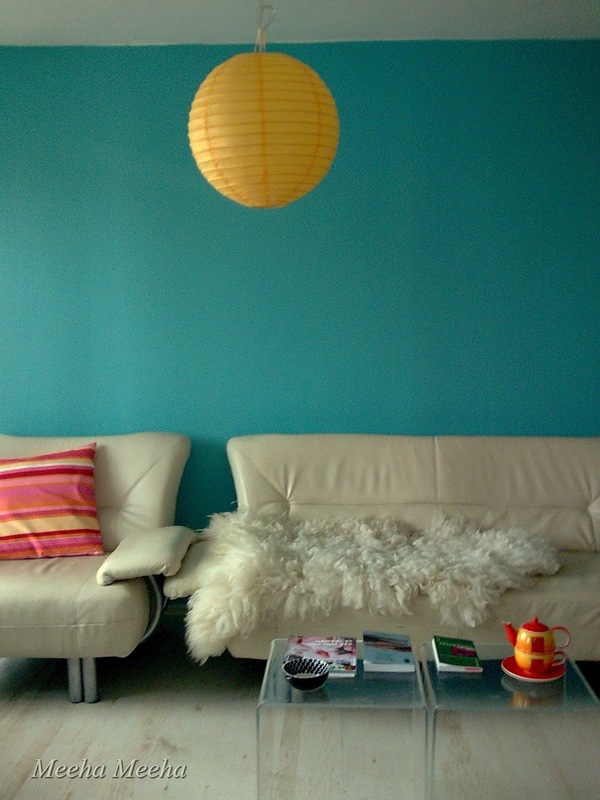 See more pics of the turquoise living room here. Yes, it did! My point is that an accent wall is easy to do and a great solution for decor adjustments. I can see from your blog you like color... in small doses. My tip to you is this: there is no "wrong" wall color, if you accessorize it in a way that will work with that color (and not against it). Paint something, what is the worst that could happen?! Great color!! Love color!!! So glad to find another that isn't scared of it! Turquoise is my new favorite all around color! Thanks for linking to Handmade Tuesdays. Love the wall! You wouldn't happen to want to divulge the paint brand and color? It's so perfect! Looks great! thanks for linking up! 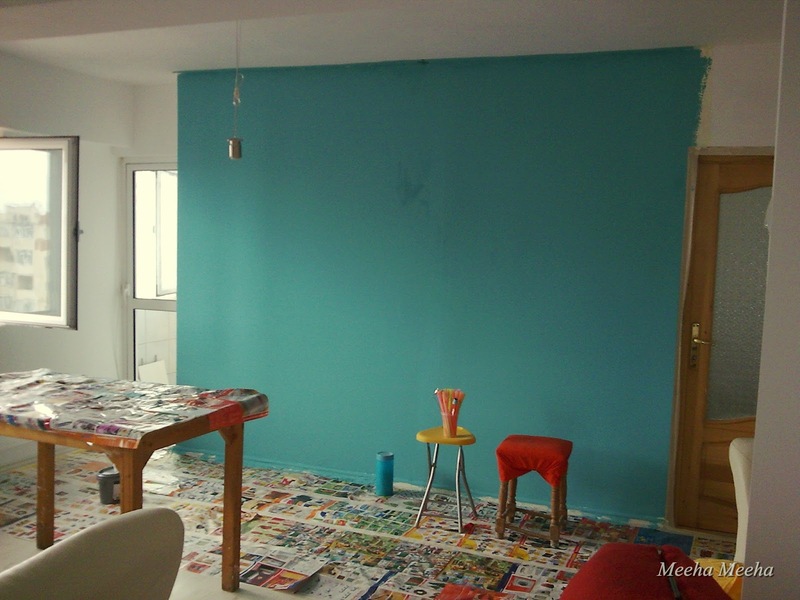 The colored wall makes the room look totally new! Great color choice too! and the yellow light looks awesome! Came over from Made by you...I love the color! It is such a great change!! 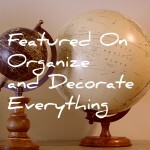 I love how you styled the room :-) Your newest follower!! I love the color SO MUCH better than just white walls. I agree with you that color is good. In my living room, I have two accent walls that are brick red. My kitchen is green. Color is good. Thanks for linking up to Romance on a Dime!! such a happy color! the living room in my last 2 places was turquoise...its been my color for a looooong time. 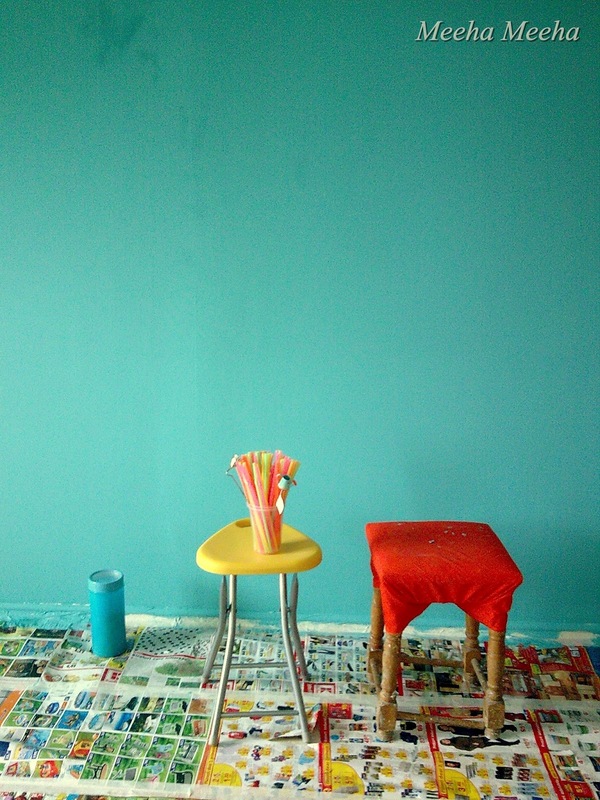 my new living room has gray walls, but the turquoise will be worked in! what is the color called? Love the color! It looks so great with all of the bright colored accents. Visting from DIY by Design. Love it! Your house must be so bright and cheerful! I just painted my bathroom this color too-it makes me happy. 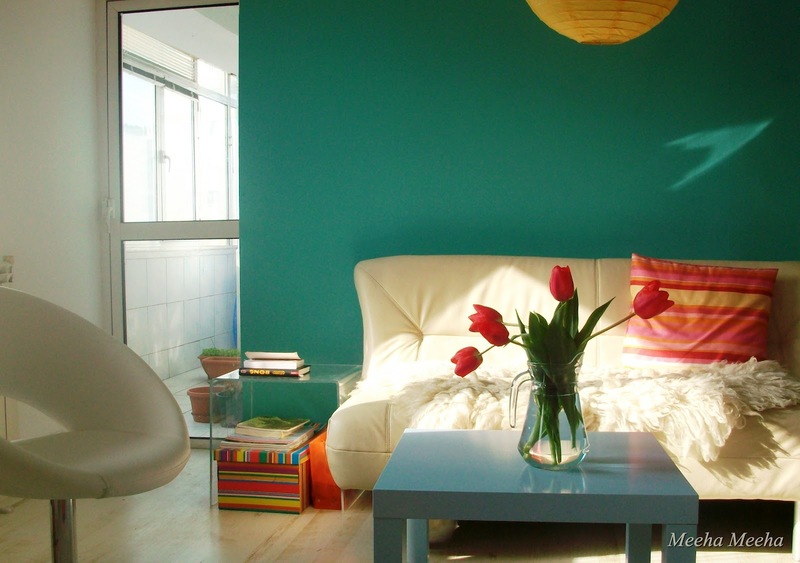 The color totally makes the space! It's gorgeous! I think that is almost the exact same color I have in my bedroom and master bath, love it. I.LOVE.IT! The room looks magazine fabulous! I love all of the colors working together. Thank for sharing the ins and outs for creating an accent wall at Show & Tell! What a great transformation. Beautiful job! Forgot to mention I'm following along via GFC too. You did a great job balancing the color of the room with its furniture pieces. Fabulous job! I love the color. We have an accent wall in our house too. It's a shade of yellow. Can you say hello?! Thanks so much for sharing at Whimsy Wednesdays. I love BOLD colors like this. It looks great! can you share the brand and color of paint? Is it flat? It is so beautiful!! Wow - how bold and beautiful. I LOVE your style! i'm so in love with that wall. and the yellow and pink accents... would love to have you decorate my place :) thanks for linking up! This came out soo great! Love the color! Thanks for linking up! Oooo, I love that rich color. Turquoise! one of my favorite colors. I love the change at your home. I love the turquoise, and the whole room! Great color and it really make a huge different. Love it!! Love that color! It looks terriffic! A color that will make you smile! Thanx for linking up to THT! I absolutely lovveeeee that color! It's becoming one of my favorites! I love how you just chose to do one wall that color-- I feel like it's more dramatic that way! Found you via Happy Hour Projects link party :) Hope you have a great weekend! Love this...I am definitely crushing on turquoise right now! what can i say? it's thrilling!!! thanks for linking to catch as catch can! What a lovely transformation in the room. You picked a great color to spice up your living room. i love your turquoise wall! i wish i own the townhouse that i live in so i can paint the wall with bold, bright colors, too. my white walls are too boring! Thank you, Miranda! Even with white walls, you can add so much color with art, canvases, textiles, wall hangings etc! Thank you for making time ti visit, Jill, you are very kind! Great color! Thank you for joining me at Home Sweet Home! Thank you for making time to visit in person, I really appreciate it! Great color choice, and I really love the decor in your home! Awesome!! love your color choice!! :) Thanks for linking up at C&I! Thank you for making time to visit each link, Angie, I really appreciate it! Absolutely gorgeous! It completely makes the room. Thank you so much for linking up with Creative Me last week! 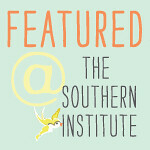 You're the featured blog this week! Wow, thank you, Jenny, from the bottom of my heart! This is totally unexpected and wonderful at the same time! Hi! 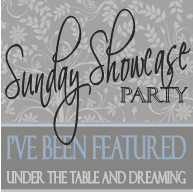 I'm featuring this on my new link party! Thanks so much for linking up!! So cute! I really LOVE that color! Thanks for sharing at Lines Across. Thank you for making time to visit, Rachel, I surely appreciate your kind thoughts! Great impact! So much more interesting and fun! I was wondering if you're interested in guest posting at my blog Stardust? 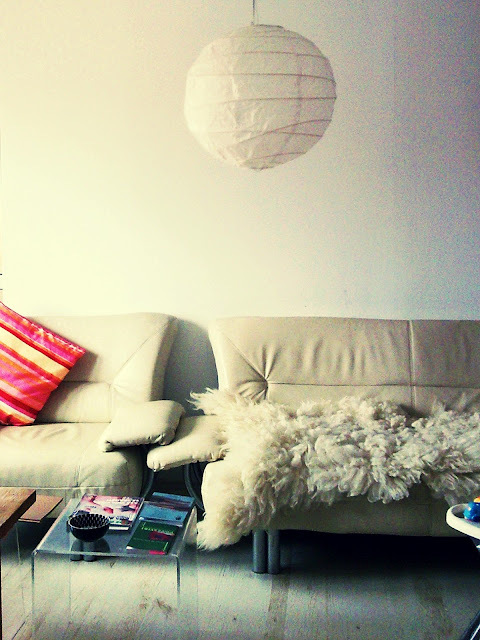 I host a guest blogger every Friday and I know my readers would love your living room! So shoot me an email! 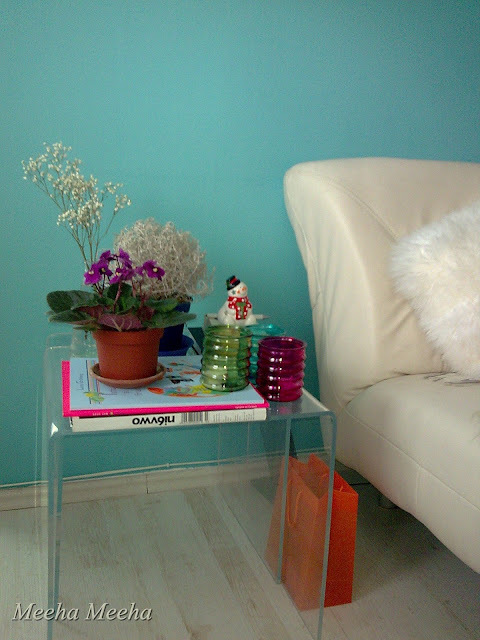 Thank you so much, Olga! I've never gust-posted before, but I will get back and would love to respond to your lovely invite! Your tourquise wall paint/makeover is simply stunning! What an advertisement for the power of paint. I have two rooms in my small MI/USA home that have been transformed by paint. Color is necessary when you have 6+ months of winter! My living room has one wall that is painted in a terra cotta orange and the family room has two walls painted in raspberry red. Yum! Oh, and yes, my bedroom is washed in a seafoam and gold. I love turqoise! Your living roon lokks wonderful! I am keeping this idea for my future house!